This costume is perfect for the girl who wants to have a unique, pretty, and eye-catching costume. It’s easy to construct when you have a few pieces of fabric and some poster board. 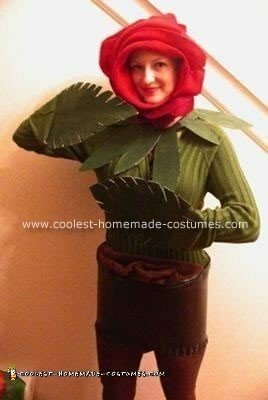 To create the rose, just slip on a green sweater (long sleeved is best) and brown leggings. Use a sharp craft knife (make sure an adult does this) to cut the bottom out of a large, black plastic flower pot. Step into the hole and pull the pot up around your waist. If you get the right size pot, you won’t have to worry about it staying in place, because it will fit snugly. It’s a bit hard to walk in, but the higher you pull it up on your waist the more comfortable it is. Stuff some brown felt into the top of the pot for ‘soil’. For the leaves on your hands, cut two pieces of poster board into leaf shapes and then cut slits up along the edge of each leaf to give them jagged edges. Score a line with scissors along the center of each leaf and bend it up at the line to give the leaf more depth. Paint the leaves with some dark green craft paint. Hot glue some hair elastics or rubber bands onto the underside of each leaf where your wrist will be, and add some at the end where you can hook a couple of your fingers onto them to have a better hold on the leaf. To make the rose leaves around your neck, cut some poster board into thinner leaf shapes and paint them dark green. Measure a piece of shoe lace so that it is long enough to go around your neck without being too tight. Hot glue the leaves along the shoe lace and then tie it around your neck loosely. The final touch is the rose itself. Take a piece of crimson fleece and just lay a square of it over your head so that the ends meet under your chin like a hood. Staple the ends that meet (or safety pin them). Roll your hair into a bun at the back of your head and then roll the fabric at the back so that you can tuck it under your bun. Continue to lay squares of fleece and red felt all over your head but don’t staple anything down. The ends of the pieces should frame your face. Trim them with scissors so that the ends are rounded like petals. Safety pin the fabric(from beneath) so that they all stay together. Fold some of the petals up and staple the fold so that the petal stands up. Wear some red lipstick, reddish blush, and fake black eyelashes to complete the look. This costume was a hit at a Halloween party I went to and won first prize, and it only took an afternoon to make. It’s a beautiful Halloween costume, and you’ll be able to make it with simple supplies that you already have! This is a fun costume, where can I get the plastic pot? I’ve been trying to explain to my friends that I wanted a costume like this and they couldn’t picture it. You read my mind!!! Would you like to make and sell one of these?